On Sept. 27, 2012, the Reporters Committee for Freedom of the Press honored three journalists and a media lawyer at the First Amendment Awards Dinner at the Four Seasons Hotel in Washington. The sold-out event was attended by more than 400 media, legal and corporate leaders in Washington and from around the country. For a complete list of donors and supporters, click here. Reporters Committee founding member Fred Graham (at right) was presented with the Distinguished Service Award, which was renamed in his honor. 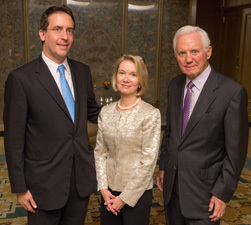 Receiving First Amendment Awards were Barbara Wall of Gannett Co. Inc. (center) and Josh Gerstein of Politico (left). Brian Lamb of C-SPAN was also an honoree but could not attend due to a commitment to the Brian Lamb School of Communications at Purdue University. “We must fight for the people’s right to know what their government is doing. This is particularly important in an election year, when it is our responsibility to cut through the partisan chatter and ensure that the electorate has the facts it needs to make an informed choice at the voting booth,” Woodruff said. Reporters Committee founding member Fred Graham was awarded the first Distinguished Service Award, which has been renamed in his honor. Nina Totenberg of NPR (below, at left) introduced him. Josh Gerstein, White House reporter for Politico (at left), was introduced by Bill Hamilton, national security editor at The New York Times. Accepting the award on behalf of C-SPAN Executive Chairman Brian Lamb was Corporate Vice President and General Counsel Bruce Collins (at left). Doyle McManus, columnist for the Los Angeles Times and a member of the Steering Committee, made the introduction.